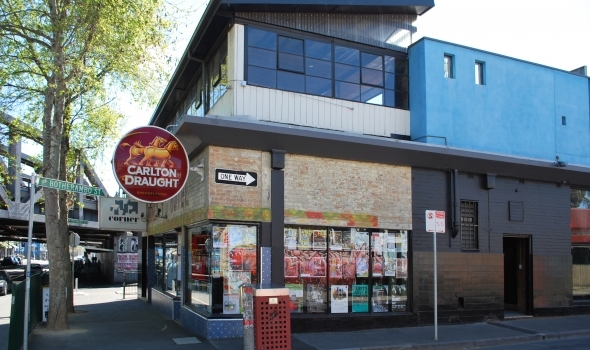 I said at the start of our last review that Richmond’s Corner Hotel needed no introduction, and over 6 years later I stand by that statement. As far as rooftop bars go, the Corner Rooftop is spectacular. Heaps of space, a tonne of tables & chairs and options for both covered areas or spots out in the sun depending on the weather/how sunburnt you want to wake up the following day. 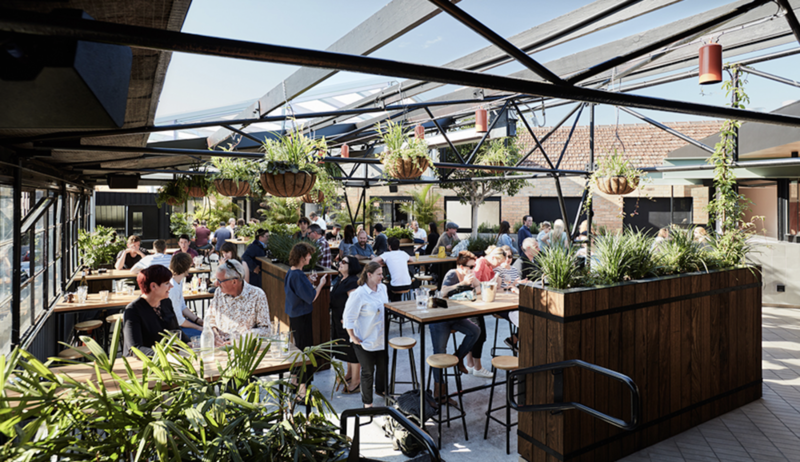 Without hyperbole I’d call it one of the best rooftop bars in Melbourne. So, other than our usual Thursday-night-parma-night, this week’s outing took place last Saturday arvo. It was a 30+ degree day so, while we started the day under the sun it quickly became apparent that we would be burnt to a crisp if we stayed out much longer, so we retreated into the undercover area with air conditioning, in front of the bar and adjacent to the kitchen. Despite the menu description spending an inordinate amount of time itemising the items in the salad and not really mentioning the parma at all, we placed our orders at the bar and waited for our meals to arrive. The tap list upstairs was relatively fine. 4 Pines, Mountain Goat Steam Ale, Brookvale Union Ginger Beer, Bulmers, Frothy, Melbourne Bitter & Carlton Draught were all on offer. On the way in I noticed that there was Stone & Wood on tap in the downstairs bar, but not upstairs, would have loved to see that one migrate upstairs also. Good god that was a lot of coleslaw! It looked fine on the plate so I picked up the cutlery and tucked in. This is where things went downhill. First up the schnitzel was cold. The toppings were warm-ish, but the schnitzel itself was stone cold. The schnitty was big enough, it used real chicken, hammered a little bit thinner than I would normally like but real chicken none the less. The crumbs on the bottom of the parma, however, were mush. completely waterlogged and soggy, all the moisture had been sucked from the schnitzel and absorbed into the crumbs, leaving the chicken completely dry and the crumbs without any semblance of crunch like a wet sponge. With real chicken at its core this had the chance to be a great schnitzel, but due to reasons we would discover shortly, this was a case of extremely squandered potential. The toppings were also in a pretty sad state. Any napoli that might have been on the parma had been absorbed/evaporated away. What looked like it was once a good coverage and golden brown grill of cheese had separated into an oily, greasy, unpalatable mess. The ham held up relatively well compared to the other toppings. It had quite a bit of flavour and if it weren’t for the off-putting taste of the cheese might have actually helped elevate this parma quite a bit. It’s not often that I don’t finish a parma, but I got halfway through this one and couldn’t take any more. As far as the parma goes this one was bordering on inedible for me. As opposed to the parma the chips were pretty good. Decent serving, well cooked and seasoned, served to the side of the parma and super crunchy. After not being able to finish the parma I was glad to have a decent side of chips to satiate my hunger. After making such a fuss over the ingredients of the salad on the menu you would think they would make sure we received everything that was listed. Unfortunately the “Bitter leaves with shaved red onion and vinaigrette” was just bitter leaves with some vinaigrette and oil, no onion to be found (some of the other plates had a sliver to two) and overall unenjoyable. Even though there was an unholy amount of it I much preferred the coleslaw we received back in 2013 to 2019’s “bitter leaf” salad. Normally this is about where we would throw in our napkins, score our meal and walk away. But like I said we weren't at the Corner Rooftop on a usual Thursday night, we were in for a Saturday Arvo sesh, and we settled in for a few post-parma drinks on the lovely rooftop. As we had moved inside due to the heat our table was situated in such a way that we could see into the kitchen, it afforded us a view into the parma creation process at the Corner and it was about this time things started to make sense - From where we were sitting we could see a tray of pre-cooked parmas (not just pre-cooked schnitzels, pre cooked parmas) with toppings on, just sitting on the bench. I watched them for 10 minutes, I watched them for 20 minutes, I watched them for 30 minutes, I watched them for 40 minutes. Then I watched an order for two parmas come through and then, while I watched on with horror, saw the 40 minute old parmas get plated up without being reheated at all (besides a few moments under the heat lamps while they waited to be collected) and the order go out. Now my cold schnitzel was starting to make sense, as were the soggy crumbs, nonexistent napoli sauce and separated cheese. Shortly after that tray of parmas was finished a new batch of 5 parmas appeared on the bench and the cycle began anew. The Corner Rooftop’s system seems to be to cook 5 parmas at a time and let them sit until an order comes through. I’m sure the first parma off the tray would have been great. The elements used had the potential to produce a fantastic parma but it was all squandered due to pre-preparation in the interest of saving time, however I wouldn’t have this parma again due to what we experienced. $24 for this parma is too expensive, that’s pretty high when it comes to a parma and for that price I’d expect my meal to be made to order. They do offer a $20 parma and pot night on Wednesdays alongside trivia, but even then I’d hesitate (although if anything the parma night parmas would probably be better as the turnover would be much higher). Now you see why I tried to distance the kitchen on the Corner Rooftop from The Corner Downstairs, I’m not 100% sure, but it would make sense if there was a second kitchen Downstairs - Making parmas upstairs and then ferrying them downstairs doesn’t make a whole lot of sense, and Upstairs seemed busy enough without worrying about Downstairs’ orders as well, so fingers crossed that the ones downstairs are better. Even McDonalds stopped pre-making their burgers years ago. I have heard of pubs pre-cooking their schnitzels and topping/grilling them to order - Not the best practice but I’d prefer that to fully topped & cooked parmas left to just sit there. Side note - One member of our group ordered the Chicken Tenders from the kids menu in lieu of a parma and was equally displeased, the “tenders” consisting of a sliced up schnitzel, just as dry and unpleasant as the one our parma was built on. The Corner is a live music institution. It is one of the best bars, best venues and best rooftop pubs I have been to in my life, which is why it absolutely shatters me to review them so poorly. I want this place to serve up a good meal, and if they knock off this pre-preparation garbage I think they have the potential to. Until then, though, I’d give it a miss.